Junior Seau will be remembered by many for his hard-hitting style of play on the field. But his gentle, kind nature off of it is what will leave a lasting impression on many more. I’m almost embarrassed to be writing this post so late. I was shocked and speechless when I first heard the news. To be honest, as numb as I was in the initial hours after the news, there was no way I could’ve written anything remotely coherent. Then I questioned if the fact that I didn’t personally know him meant I lacked the authority to write on the subject. But in driving to work yesterday, I heard Colin Cowherd (on his show, The Herd) replying to a tweet in which the writer stated something along the lines of “No extraordinary man commits suicide.” What?!? With the wounds still very much fresh in the heart of the thousands–not hundreds, thousands– of people, he had the audacity to say something like that!?! So, even though I’m certain that I will fall well short of expressing what I and many others feel about Junior Seau, this is my humble and brief attempt to do so. I grew up, and am still, a die-hard Cowboys, not Chargers, fan. I dreamed of and played cornerback my whole childhood. Not linebacker. And as I said before, I have never met Junior Seau in person. But like the thousands of kids he’s helped through the Junior Seau Foundation, albeit probably not as dramatically, he touched me. When I saw him play, I saw what it meant to give all of yourself to the game of football. When I watched his interviews and saw how unassuming and down-to-Earth he was, I saw what it meant to be well rounded and a man of integrity and inner strength. And the occasional glimpse into his personal life provided a model for me and other fathers and fathers-to-be to follow. Indeed, his actions spoke loudly and the message was received by many. Like I believe and try to live my life, Junior Seau exemplified what it means to share with the world every gift that God has given you. 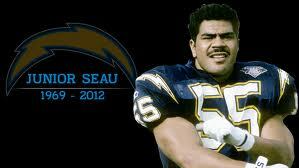 To use every ounce of talent, Seau proved, is an obligation. To share the gifts we have been given with others, he revealed, is a responsibility. And the fact that Junior Seau lived his way too short of a life embodying that message proves that he was, without question, an extraordinary man. No matter what that fool who tweeted to Colin Cowher said. I am an executive finance professional with a love for process and application development (MS Access, Excel, Quickbooks), mostly as it relates to Accounting and Business Functions. I also love to write and share ideas with other people in this world. I'm an admitted Gym Rat who works out excessively. The best summation of me is that I love to teach and to learn. Bobby…thank you for your honesty and passion!! Thanks for the positive reinforcement, Julie. That’s the only way I know how to live, thanks to Momma Bluford! “Momma Bluford” – love it!